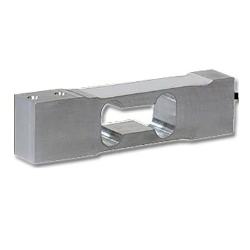 Scaime AG load cell features mounting screws which are 1/4-20 UNC (coarse) with 3/4" spacing on both top and bottom. 2 mv/v, 0.02% total error, 415/350 ohms, 3m 6 cond cable, anodized aluminum. NTEP 91-051 S III 5,000 div 5kg - 100kg. Similar to Tedea Model 1040. Scaime AG load cell features mounting screws which are 1/4-20 UNC (coarse) with 3/4" spacing on both top and bottom. 2 mv/v, 0.02% total error, 415/350 ohms, 3m 6 cond cable, anodized aluminum. NTEP 91-051 S III 5,000 div 5kg - 100kg. Similar to Tedea Huntleigh 1040.